Visitor Management New York City: How Does SV3® Work? The threat of terror is all around us in today’s world. That’s why our buildings and facilities, especially in New York City, need advanced visitor management to keep track of the people coming in and out. There are several different methods to protecting your building, employees, and patrons from security threats. But what is the best way? At Building Intelligence, we’ve mastered the visitor management aspect with our SV3® solution. SV3® is a cloud based solution for managing visitors, vehicles, and vendor access to our facilities which are susceptible to attack and danger. You can protect your buildings from the “unknown” by ensuring that the people and vendors arriving at your facility are properly vetted, screened, credentialed, and approved. With no server costs and no hassles, the SV3® system provides integration with turnstiles and access control, allows you to update and manage watch lists and security notifications, provides invitation emails with custom QR codes, gives you or your staff notifications upon visitors arrival, and much, much more. Even better, Building Intelligence provides all of the necessary support, upgrades and services itself, providing tremendous value to you without any loss of performance or security. With SV3®, you can keep your building free of the wrong, and often dangerous, people who are looking to create terror and destruction. On top of that, it gives your visitors an added sense of security and peace of mind, knowing that they’re walking into a fully protected facility with authorized staff members inside. So, now that you know the benefits of SV3® from Building Intelligence, does your facility feel safe? It can. Contact us to see how we can help your facility needs, and keep reading below to find out how SV3® works. SV3® is no ordinary visitor management system. Building Intelligence has been operating visitor management in New York City for over 10 years, and has worked tirelessly and efficiently to provide a unique and effective security management operations system. With SV3®, we have created a solution to the problem of security risks and unwelcome visitors in our buildings, warehouses, and facilities. Register: SV3® allows your staff and/or tenants pre-register approved visitors and their vendors while also allowing them to track their entry and exit. Your visitor records are all stored in an online, color-coded visitor list, which improves and automates lobby security while eliminating the human error associated with physical log books. Schedule: The staff/tenants in your building can also schedule their approved visitors for certain times. They can be scheduled and tracked from anywhere at anytime using the SV3® system, making visitor information easy to track and organize. You can receive email and/or text notifications for your scheduled visitors upon their entry or departure. The sign-up for your visitors is easy and fast, and you can also upload a mass guest list for scheduled events. Check-in: SV3® has a customized badge-printing system which allows you to print photo ID badges with previously scheduled check-in and check-out times. This allows guards to pre-print badges to provide that extra security step while also notifying the staff of a visitor’s arrival. All of this is done through a cloud-based web application, which also generates a convenient QR code for check-in and check-out. Guards or self check-in kiosks integrated with SV3® software will know whether to authorize entry through these badges. Secure: SV3® technology allows you to quickly and easily capture complete visitor data from a driver’s license or a business card, including a photo capture in under five seconds. By scanning a license or ID, you can identify, authenticate, and store visitor photos as well as track your visitors from anywhere, anytime. Our visitor management technology allows you to then access that visitor information easily. It also allows you to receive watch lists, security notifications, and security instructions. 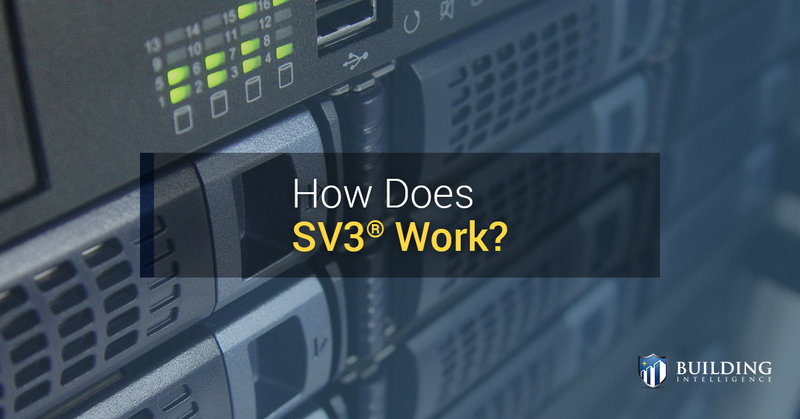 Now that we know how SV3® from Building Intelligence works, and how it can help you efficiently cut down on lobby room wait times and prevent unwanted or risky guests, we can look at some of its other benefits. Chief among those benefits is the value of your investment. With SV3® facility management solutions, you can cut down on security and operational personnel while also cutting back on the risk for any third-party liability, a decrease in insurance premiums, and most of all the removal of the liability of the Terrorist Act. Your building can operate securely with an SV3® Kiosk, which offers self-registration and check-in as a mobile solution, helping to eliminate those personnel costs. Plus, with visitor tracking and monitoring, there’s no doubt that you’ll have a friendly, safe environment that minimizes your risk of attack and liability. With all of the threats out there, you can’t afford not to invest in SV3® visitor management from Building Intelligence. Are you doing everything you can to protect your building? Contact us to find out how you can better protect your building, lobby, loading dock, and more. Schedule your security analysis today.